Asmita Shirali practices in the area of corporate law, concentrating in intellectual property, technology and e-commerce. She has had extensive dealings with a broad array of issues related to intellectual property and technology law, including the acquisition, financing and commercialization of intellectual property assets, strategic alliances and joint ventures. She has expertise in license, sponsorship, merchandising ventures, and information technology issues. She counsels clients on a wide spectrum of intellectual property matters including copyright and publishing contracts, trademark portfolio maintenance, trade secret, patent, rights of publicity, multimedia, advertising and promotional issues. 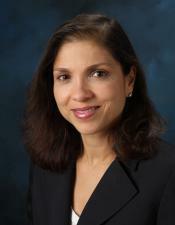 Some of her client representations include a national physicians organization, acquiring the naming rights for the a MLB stadium, sponsorship of regional sporting events, software and copyright matters for an NHL team, and representation of a museum regarding their sponsorship and merchandising program and worldwide trademark portfolio. She has been an adjunct professor and Practitioner in Residence at Case Western Reserve Law School, where she taught intellectual property related contracts classes. In addition, she created and led the Intellectual Property Law Clinic supervising third year law students as they represented students from the Cleveland Institute of Art, advising them on various intellectual property legal issues relating to their portfolios and their start up business ventures.